The swells pounding the North Shore yesterday were apparently the biggest in 10 or 20 years depending on who you ask and how you measure. Drew says the waves were the biggest he has ever seen. There were no safe beach landings to consider, and many sections of highway were continually getting covered by sand and rocks from the crashing surf. There were emergency crews everywhere. Six pilots headed out to try and surf the skies above that coastal carnage, and three of us were lucky enough to drop in and score some serious long rides. We had been watching the forecast for a week ahead, hoping the backside of the cold front would provide the kind of nice northwesterly conditions we remember from the best frontal passages in years past. Sure enough it looked good as soon as the day dawned. We struggled to get out there as soon as we could, but local boy Drew made it up first, and I scrambled up to arrive just as he was launching. Drew and I have shared a lot of light scratchy thermic sea breeze flights out there lately, but this day turned out to be the polar opposite. Strong and smooth cool onshore flow provided easy ridge lift to get started, and then we were delighted to find the kind of massive convergence lines away from the hill that we often get on these northerly days. 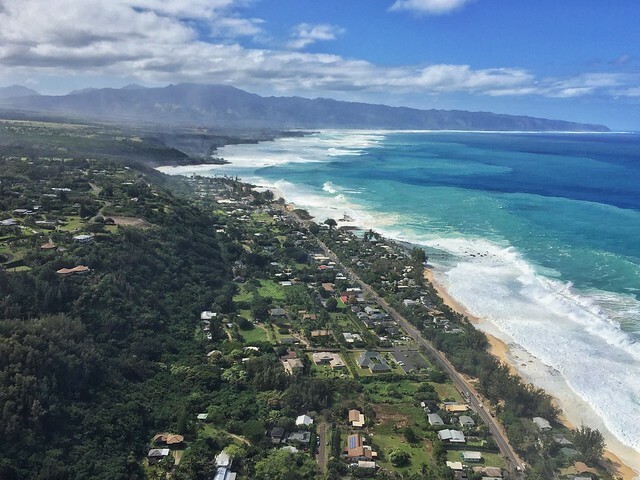 We flew one easy lap to Waimea and back, and then we got high in the convergence out towards the ocean on the Kahuku side, and considered shooting for Turtle Bay. But there were no good bomb outs along the way, so we saved that idea for a day with smaller surf and bigger beaches. Drew headed back to Waimea for a second time and I followed. Then I saw him keep going across the bay. Uh oh. This is the part where I had to decide if I was gonna double back to grab a car for retrieve, or grow some big ones and follow him across to seek our fortune on the much smaller ridge on the other side, the one covered with power lines and fronted by thick brambly forest, rocky surf-blasted coastline, and a couple of dense little neighborhoods. One of which is Drew’s. Somehow I mustered the courage to follow, remembering a fun little jaunt to Chun’s the last time we tried this, although that was on a day with miles of broad sandy beach to land on. Today I figured I could land on top of the little ridge if absolutely necessary, since there weren’t any good options visible in front of the ridge. I followed him across and barely cleared the power line poles on the far side. Now it was time to find some lift! Ahead of me, Drew wasn’t making it look great, but I was already committed to this crazy line. He basically just surfed the low ridge line ahead as it tapered down to nothing, never stopping to work anything that looked like lift, but boating along pretty comfortably. It was definitely windier down this way with not much ridge to slow things down. I stopped at one point behind a neighborhood to work some very blown out feeling lift, but it pushed me back so far that I burned up all my altitude coming back out. I saw Drew disappear into a distant field way ahead, and I set my sights on joining him. I was trying to game the power lines below so I wouldn’t have to land on the mauka side of them, but I wasn’t finding the boaty lift that Drew seemed to have had. As I got closer to him I really didn’t feel like I was gonna make it that far, and the power lines were rising up to block my path to his field. Somehow I managed to pop myself over at the last minute and found myself swept by a swirly gust of wind into the tall grass next to Drew’s spot. Whew. I hate those low power line experiences but somehow I seem to have had a lot of them. But it sure felt good to have made it this far. I asked Drew what we should name this nice landing field that he had found, a sweet clear oasis in a desert of overgrowth. Like, I was willing to call it Drews or something. But he said, dude, it doesn’t need a new name. We’re at Lanis! I’m such a North Shore newbie I didn’t even recognize the place. As we were folding up in this beautiful field, Drew mentioned that he felt bad for landing here because he knew there were all kinds of no trespassing signs on the gate. Sure enough, before we had finished folding, a couple of ladies came zooming out from the house in the distance on an electric cart, and they were screaming bloody murder. What the hell are you guys doing? Get out! Get out! Drew stood up calmly and walked towards them. He said, Hi Patty. She was still yelling. He said again, Hi Patty. This time she heard him, and a slow smile crept across her angry face when she recognized him. Drew?? Then he said, yeah Patty, I’m really sorry about landing here, we got low and had to make some tough choices. Apparently he knows her from some electric work he’s done for her, among other things. Man what a lucky break. She said next time he should call to let her know it’s him so she doesn’t have to freak out. She said they have problems with people coming in and bothering the cows. We jumped the gate to the highway at Lanis, where police and lifeguards and highway workers were busy with the traffic and the horrible state of the road. If Drew hadn’t already proved himself the best wing man ever, he proceeded to show even more good karma by scoring us a ride in the first pickup truck that came by. We enjoyed a slow ride to Pupukea Foodland where we picked up some food and beverages to slake our terrible thirst and hunger. Meanwhile other pilots were making their way out for the late session. Duck was arriving at V-land and getting ready to hike. I said don’t wait for us, we’d be a while finding another ride. Meanwhile Tim and Justin had got frustrated crawling along in the slow traffic passing Lanis, and they turned around to eat lunch in Haleiwa. Shawn joined them there. But by the time they got ready to try again, the road was closed to all non-local incoming traffic in both directions. They were turning people around at Lanis and also at Turtle Bay. Duck didn’t know how lucky he was to have made it though in time. He launched for a nice hour of solo flying in what he described as disconcertingly strong convergence. He shot up to 1,400 feet right off of launch, higher than Drew and I got during our whole two hours of flying. I wouldn’t mind seeing that track log! He ended up landing in the sheep pasture near the public access to V-land, not far from where we all parked. Drew and I enjoyed a long leisurely picnic at Sharks Cove, watching the enormous waves pounding the poor little tidepools there. Finally Drew’s karma kicked in again and got us one last ride from a buddy who had been doing some work nearby. You just can’t buy that kind of good luck. We met Duck and wandered out to the beach at V-land for a long happy debriefing, watching a lone crazy surfer riding a few nasty looking waves and doing his best to avoid the strange currents in that stormy soup. The last bit of good karma from Drew: during our debrief he told us that as we were flying above Pupukea, he had taken a phone call from a buddy whose aunty lives up there and had seen us flying low over her house, and she was upset and planning to call the police to complain. But Drew’s buddy explained to her that it was Drew, and she was apparently mollified by that. I don’t know what would have come of the complaints, especially on a day when the police had their hands full with the traffic and the surf washing over the road, but it's just as well we had Drew along so we didn’t have to find out! I shot some video but somehow the case got smudged at some point which is pretty annoying to me. I just slapped together some okay looking clips and added some music I like that reminds me to keep my clearance over power lines. When I named this story really big ones I didn’t mean brains. I meant really big sacks of luck. The kind you don't want to empty out before you fill your other sacks with skills. And finally: Thom, this story is really for you, dude. I know it’s boring at the rehab hospital. Hopefully you got a little entertainment from it. It was great to find a corner to read. Drew is an awesome guy to have around. Even though he shamed me into shaving my moustache and he is a younger version of that needler ike. Alex- Nice write-up. Thank you. I don't do much XC but I'm always intrigued by landing decisions. In this case, what prompted you to make a low hop over the wires, rather than land on the dirt road? NICE! That is some big surf. What Doug said! Dave, I'm not sure if you know him, but Doug is our long departed and sorely missed cross country champion and guru, currently leaving paragliding contrails in the skies all over the flatlands of eastern Washington. As Doug notes, cross country flights are a long series of decisions about risk and reward. It's what many of us like best about flying. Of course we want the consequence of the risks to be just whether or not we reach a particular destination, not whether or not we fry our nads on live wires. Many cross country flights will inevitably involve power line crossings. Shoot, many local ridge soaring flights do too! I probably wasn't any closer to those power lines than we are when we're working light lift just after launching Manics or Juice at Makapuu. Or when heading to the LZ at Kahana after getting too low on the ridge. In this particular flight, I had finally reached a point where there were some landable fields makai of the power lines, but I wanted to stay along the little ridge to milk the tiny bit of lift I might find and get a little farther. But as I got lower I had to make sure I ended up on the side of the lines where the good landings were. I don't think that the dirt road just below the power lines was a good option at all. I can imagine a lot of ways that landing could go wrong. So I was pretty determined to end up on the mauka side. Of course I could have made that decision a lot earlier and it would have been less risky, but I definitely wouldn't have got as far along my route. I'm personally happy with the decision just as I made it! Is that just because I got away with it and landed where I meant to? I don't know. I realize that a lot of people will watch this video and wonder what could possibly be worth taking risks like that. But I'm pretty sure those people aren't cross country pilots. I am one, and although I'm not terribly accomplished or skilled at it, I can't enjoy any other kind of flying anymore! Thanks guys (and sandy) for the explanations. I wasn't trying to second guess it, just trying to understand the decision process, and see if I can read the conditions and options. Some day I might join you on a down range adventure, but for now I'm pretty happy just staying in the playground. Cheers.